Philadelphia Inquirer Eagles beat reporter Zach Berman takes fans on a journey through the action-packed season -- from the preseason and midseason player pickups that shaped a championship team to the gut-wrenching injury of star quarterback Carson Wentz through to the bold play calling and nail-biting moments in Super Bowl LII, in which the Eagles bested the favored-to-win New England Patriots. 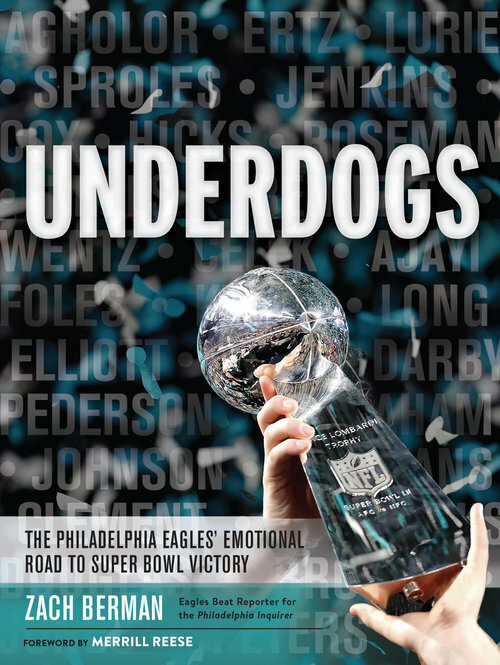 A book unique in its scope and insight thanks to Berman's on-the-ground reporting, Underdogs will detail the unlikely story that captured national attention; explain how the team resonated among a desperate fan base that waited 57 years for a championship; and even delve into the players' social activism during a particularly political NFL season. With a foreword by beloved Philadelphia radio announcer Merrill Reese and an 8-page full-color photo insert, it's the perfect keepsake item for anyone who bleeds green. During his six years covering the Birds, Berman has developed relationships with some of the most notable characters that led the team to Super Bowl victory. In Underdogs, he'll explain why Nick Foles contemplated retirement on his way to winning Super Bowl MVP. He'll detail Howie Roseman's journey to NFL executive of the year after being cast aside by former coach Chip Kelly. He'll show Malcolm Jenkins' journey to team captain, how Chris Long's life changed in a Tanzania hotel bar, why Eagles kicker Jake Elliott didn't consider football until he was chosen at random at a high school pep rally, and where Carson Wentz ate dinner the night before he left for the NFL Draft. These more obscure stories offer incredible context and depth to an already fascinating story of success against the odds. Zach Berman covers the Philadelphia Eagles for the Philadelphia Inquirer and Philadelphia Daily News. He previously wrote for The Washington Post and Newark Star-Ledger, and was a contributor for The New York Times. He also makes regular television appearances on NBC Sports Philadelphia. Zach is a graduate of Syracuse University's S.I. Newhouse School of Public Communications and lives in Philadelphia with his wife, Emily, and son, Reid. From covering a 10-win NBA season to reporting on the longest win streak to end the regular season in NBA history, Molly Sullivan made her mark in Philadelphia. Earning the trust and respect of viewers, players, coaches and others around the league, Molly proved to tell the story with a professional and authentic approach. With 13-years of experience in television, 10 of those years in sports, Molly currently works for the World Champion Philadelphia Eagles as a host and reporter. On gamedays, Molly hosts the pregame and halftime show along with RedZone highlight cut-ins. During the week, Molly serves as a team reporter from practice and covers events around the community.